Have you ever heard about ABPA, before? "No"? Are you (or your loved ones) suffering from asthma, any allergic reaction or chronic lung condition? If so, you are at high risk of developing this health problem. What exactly is ABPA? Is it a serious condition? Well, if you do not take steps to control this condition then it can get worse and may damage your lungs. Don't worry; it can be well controlled with medications. But, do not leave it unattended. Instead, get the proper treatment done. Before we jump on how to manage this condition with natural remedies, it is better you learn about this condition, its symptoms and causes, first. WHAT IS ALLERGIC BRONCHOPULMONARY ASPERGILLOSIS (ABPA)? Well, Allergic Bronchopulmonary Aspergillosis (ABPA) is an allergic reaction to a fungus known as Aspergillus fumigatus. Aspergillus fumigatus is fungi found in several places such as soil, water or dust etc. It occurs when you breathe in this harmful fungus. Ingestion of Aspergillus fungus can cause a chronic allergic reaction that may lead to inflammation (swelling) of the lungs. Most of us are frequently exposed to this fungus but the reaction to this fungus is rarely seen in people with normal immune functions. While in some people, immune system acts too vigorously to this fungus and may damage the airways. This can lead to serious condition, lung damage. HOW BOOSTING IMMUNE SYSTEM CAN HELP COMBAT ABPA? Are you worried from stepping out in the season of a dusty storm just because you are afraid that you may experience allergic symptoms, later? "Yes"! On the other hand, your friend is walking in the afternoon through blossoming fields without experiencing any allergic symptoms. Why it is so? Simple, it's because of the immune system! What is the role of your immune system, here? Keep on reading to get an answer of this question! Our immune system, when in balance, does a seamless job of providing protection to our body by eliminating potential threats such as toxins, dust, bacteria and virus etc. So, you can say, your friend may have a balanced immune system. What about your immune system? Think about it! Well, sometimes the immune system overreacts to a foreign substance present in the environment. When our body acts to eliminate this threat, we may experience allergic reaction symptoms such as a runny nose, coughing, itchy or watery eyes. 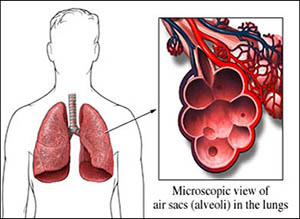 Moreover, this overactive immune system can affect lungs as well. Now, you may be wondering if your immune system is overactive or not. Chances are, you may have an unbalanced immune system. People with asthma may notice that their asthma symptoms are progressing or worsening. So, take extra care of yourself, if you are already an asthmatic. Ayurveda has been practiced in India for at least 5000 years. It has gained popularity in the western world also, though as an alternative medicine system. According to Ayurvedic principles, everyone has a specific prakurti that determines his health and disease vulnerability. Prakurti is determined by 3 "doshas" (pitta, vata and kapha) known as bodily energies. Disturbances in any of the three doshas may leave an individual more susceptible to a health condition. The basic concept of Ayurveda is to maintain your health without looking at disease but at the host. That means it will help you manage your condition by targeting the root cause. Ayurveda believes in balancing the affected dosha while managing the symptoms of any disease. The interesting thing, Ayurvedic medicines do not cause side effects. IS IT POSSIBLE TO MANAGE ALLERGIC BRONCHOPULMONARY ASPERGILLOSIS WITH AYURVEDA? Planet Ayurveda has excellent herbal formulations to help people with ABPA manage their symptoms in a safe and natural way. 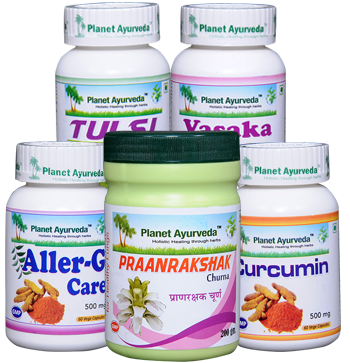 Planet Ayurveda uses only 100 % pure and standardized extract while making any natural formulation. All products are free from additives, preservatives and other chemicals. So, they are free from side effects as well. Apart from proving beneficial to manage specific symptoms of your health condition, each product from the house is designed to provide extra benefits to your body. What more do you want? You are getting natural and safe herbal supplements with additional benefits. The following combination of dietary supplements by Planet Ayurveda can do the wonders for people with Allergic Bronchopulmonary Aspergillosis! It is an amazing herbal formulation for allergy from the house of Planet Ayurveda. A unique blend of 4 herbs is used in this product to effectively manage allergic reaction symptoms and boost immunity. DOSAGE- 1 capsule twice daily with plain water. This formulation is packed with anti-allergic properties that can help you deal with allergic reaction symptoms caused by fungus. It can help manage symptoms such as shortness of breath, coughing and wheezing. This amazing product contains herb that also possesses immune-boosting properties that can help balance your immune system as well. DOSAGE- 2 capsules twice daily with plain water. This product is packed with standardized extract of Tulsi herb containing antifungal properties that can prove beneficial for people with fungal or bacterial infections. It can help your body to adapt stress and anxiety as well while supporting your immune functions. It is prepared using a combination of 7 effective herbs that can help manage asthma or other seasonal allergic symptoms. It is an amazing dietary supplement to cope with respiratory tract infections. DOSAGE- 1 teaspoon twice daily mixed with honey. It is made using a standardized extract of vasaka herb, which possesses antibacterial properties that make this product effective against bacteria and fungus. This product acts as a natural expectorant that can help remove phlegm from lungs while maintaining healthy functioning of the respiratory system. What are you wondering, now? Try these herbal formulations if you are also among those suffering from ABPA. Stay healthy!